" Sweet Goodness From Nature "
There is an Irish legend about an ancient line of Of women who have the ability to metamorphosis into Queen Bee's. They were blessed to capture magical rays of sunshine that infuse the honey with magical properties that heal broken hearts and infuse the soul with healing properties. Anyone lucky enough to taste the magical golden elixir will be able to see the Queen Bee when she is in human form as the Queen Bee. 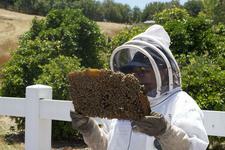 Bee Keeping is a very rewarding and interesting art and science. I have always had an interest and lover of honey. We wanted to use of our organic farm to provide sustenance and a stream of income that will help finance and mitigate the cost of operations. We must by maximize the wise use of the land for the greater good of nature and mankind. As we grow we will post updates and when we will be harvesting the honey. We'd love to invite you to our "Harvest Party". 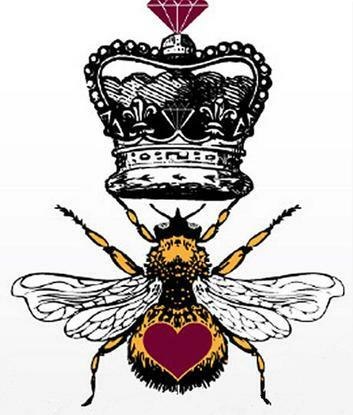 I want to share with you a bit about Bee Keeping and running "Queen Bee Honey Farm" Contact us with any questions or comments you may have. This is just a snap shop of what happens on a Honey Farm and the art of Bee Keeping. 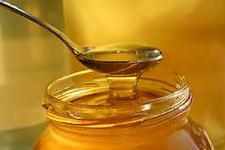 Wouldn't you love to produce your own fresh honey to cook with or drizzle over a fresh hot bun or toast? Each bee can produce 1/12 teaspoon of honey in (about 6 weeks), a colony consisting of thousands of bees, that can fill up honey combs quickly. We harvest the bees wax, wax is another usable product of bees. 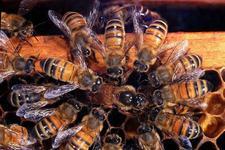 Bees convert their food and make it into the wax comb. Wax is used in many ways, including candles and cosmetics. 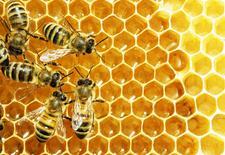 Many creams and lipsticks, lip balm contain beeswax. Bees are constant workers. We have a free labor force that will produce honey and wax that we use to create products that we sell. Bees are independent, they do require time commitment on the part of the bee keeper. The time spent on managing the bee hives is a fraction of the huge benefits we receive from our bee's. 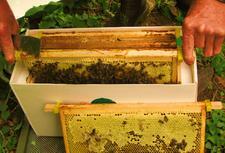 There is so much more to running a Honey farm and many more benefits and rewards. Keep checking back for updates. Live The Life You Love! Love The Life You Live! Our mission and dedicated goal is to establish honey farms that focus on planting cover crops, flowering fruit trees and plants that have a Non-GMO origin and are pesticide free with a certified organic origin. The reason for "Colony Collapse Disorder" Is the contamination of bee hive directly related to (Neonicotinoid Pesticides) The most globally used and approved pesticide. 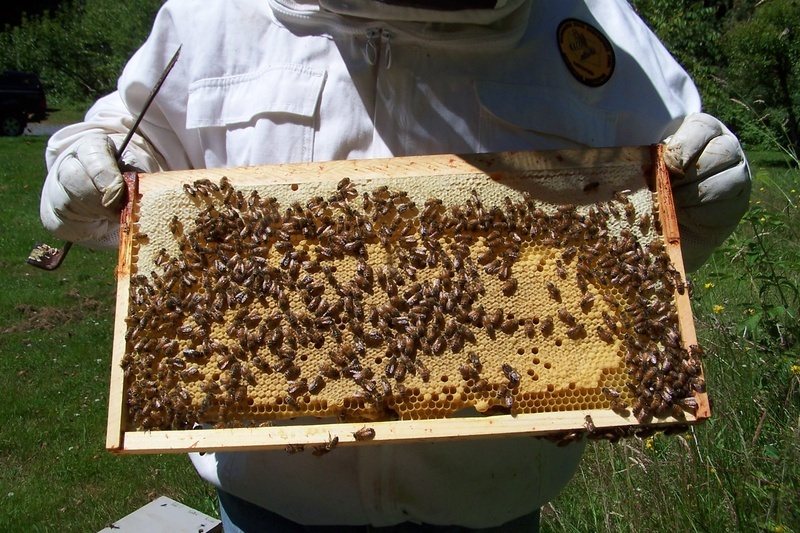 The National Bee Keepers Association and other organizations to include citizens and independent bee keepers around the globe are dedicated to protect honey bees and to provide an eco-friendly, contaminate free habitat. All of our honey labels will list the specific location and zip code where the honey is produced. None of the honey produced at our honey farms will be blended with honey batches from other locations or sources.. In Essence you will know exactly where your honey comes from and the environment it is produced in. This is not true of many honey brands sold on the market today. Please join us in our fight to establish honey farms that grow forage, plants and trees that provide a non-gmo, pesticide free pollen and nectar food source for our honey bees. Please help us to develop and make this worthy cause a reality with your valuable and much needed donation through PayPal. The majority of the planet’s 100 most important food crops depend on insect pollination. We have created a program for Veteran's, Wounded Warrior's & Military Families. I am a former military wife and still a military brat. It is our way of giving back to those who have sacrificed and given so much. This is a program that is open to Veteran's, Wounded Warriors and Military Families only. The program is provided at ZERO cost. All onsite training, equipment, (5) bee hive starter hives, are all provided/sponsored through Mount Royale Ranch & Queen Bee Honey Farm. As part of the program they can elect to receive training as an "Organic Farmer & Sustainable Living " classes. This will be held in an outdoor environment, hands on. Each person who completes the training will be given assistance with land selection for the homestead, starter organic seeds and or plants to start their organic garden. All who participate and complete the training will receive ongoing support and training as needed. For those who wish to learn how to live a sustainable lifestyle, become a bee keeper and produce honey for profit and or personal use. We are here and happy to help you to live a life you will love and reap the benefits from. Simply use the contact for to register. Space is limited! You may haul in your RV or trailer to stay in during your stay at the farm during the training period.